If you've ever scanned in a watercolor drawing (or any image with soft hues and delicate color transitions) you probably know the horror of seeing your digital image looking VERY different from the original. Where black-and-white images or strong colors are quite easy to edit, techniques like watercolor and colored pencil require more care. Especially if you prefer leaving parts of your paper white, but don't want the paper structure to show up in eventual prints or digital presentations. So while I'm still new to color images and maybe not the best choice for advice, I'll show how I usually edit my watercolor drawings in Photoshop. Photoshop can be purchased on a monthly basis, which is a bit of a curse and a blessing in one. While I hate paying every month instead of just 'getting it over with' once, I'm glad that this takes care of eventual program updates, and it makes the initial expenses a lot more manageable. While I've used a lot of different graphic programs, from freeware like GIMP to Paint Pro SAI, Corel Painter and Clip, I do come back to Photoshop for image editing all the time. It isn't the most intuitive program for actual 'painting' (that's where Corel Painter wins...) but since I prefer painting traditionally anyway, that doesn't bother me. But these tips should be applicable to a lot of programs since I'm not using anything fancy. The basics are, well, basic enough to work nearly anywhere. First, you'll need something to scan, of course. Select the highest resolution that works for your laptop/PC. I work with 600 dpi since that allows me to zoom in while correcting the image - anything beyond 600 dpi is just a pain in the ... backside of my laptop. Once you've got your scanned image open in Photoshop (or graphic program of your choice), crop it and duplicate that layer! Having a layer, set to invisible and pushed to the very bottom, is the perfect backup and comparison material for when you mess up along the way. I apply a selection mask to my objects first. It's a lot of work, yes, but I've found that trying to get the background white by color selection/adjustment layers only, I always use more color nuances than necessary in my drawings. Especially for my sticker motives I like to keep the 'hand-painted' feel and the editing to a minimum, so this gives the closest results. Go to 'Select' and choose 'color selection', then click on the white color of the paper to give the program a color reference. This will select all white or white-ish spaces on the drawing, with more or less leeway depending on the percentage you enter. Play around a bit - this really depends on your paper, the intensity of your watercolors etc. But really, don't fret too much if the selection isn't all that accurate. Because next, we'll expand that selection (by clicking on 'Select', then 'Options') by 1 pixel, thus swallowing some of the pesky dots that refused to be selected. Then, inverse the selection (again under 'Select') so that instead of your white space, you have only the colored objects selected. Create a vector mask by clicking on the tiny symbol at the bottom of your 'layers' window. This makes everything that isn't part of your selection transparent. Now for the incredibly dull part: Take out your graphic tablet and refine that mask. This means both correcting the borders of objects and the interior of objects where you'd left white space or only very light colors in your drawing. Really, my only advice for this is: Reduce the size of your Photoshop window and re-watch your favorite episodes on Netflix on the same screen. For reference: Correcting the mask for my Bonsai trees took two episodes of Parcs & Rec. Yay. Good times. Yes, it's possible to get good, clean results without masking. But especially if you want to 'cut out' individual parts of the drawing (like individual trees) to make stickers, re-arrange the layout, or plan on printing anything: You'll be glad you did this later on. Our eyes see details like gray smudges or dots much better on paper than on screens, so while your picture might look clean on the monitor, you might be in for a surprise after printing. Bonus Tip: Personally, I find working on a transparent background or white background incredibly hard on my eyes. That's why I created an extra layer in a dark color. Much easier to spot stray smudges this way! Upper right part of the tree is 'cleaned up', the lower left leaves much to do. I tend to leave a slight border around my drawings, especially if I have used a pen instead of just watercolors. It's easier to keep the drawing's borders looking natural and hand-drawn instead of overly digital. But every image requires a different approach. You can also see that now that my masks are in place and the clean-up well-advanced, I've started playing around with adjustment layers to see how my final pieces will look. I mostly adjusted brightness levels and cranked up vibrance, saturation and shifted the hue slightly down. Color Balance comes in handy especially when working with colored pens to draw the outlines, like the sepia I'd used for these. Sometimes, they can look too bright or not match the colors in the aftermath. I toned down the yellow in those lines via Color Balance. Once every tree is corrected, a right-click on the vector mask (the small black and white thumbnail in the layers window) and selection of 'apply layer mask' will make the mask permanent, leaving you with individual images on a transparent background: No paper textures except in the drawings themselves, no smudges, no dust grains from the scanner. Then, I can select individual trees with the lasso selection tool, copy-paste them into new files and save them individually for future use - like arranging them on A4 paper for printable files, or smaller formats for sticker sheets. Here's where the initial 600 dpi decision comes in handy: I only need 300 dpi for my prints, which makes the trees large enough to work on A4 paper despite the original drawings being slightly smaller. Is this the most time-effective way of getting a white background? Nope. But it is the way that keeps my original drawings looking as close to reality as possible, with me being able to adjust the background and the drawings separately. I'm not sure if this 'tutorial' is helpful - I do hope so, but I think you'll need to know some Photoshop/graphic program basic knowledge, like how to work with masks and adjustment layers, to follow along. So do tell me where I should expand or add additional steps. I'm thinking of doing a breakdown of how I create coloring pages, too. The finished drawings can be found on my Etsy both as printable files and sticker sheets. Inspired by the #marchmeetthemaker challenge over on Instagram, which introduces a variety of handmade businesses and has me try out new ways of showing my 'behind the scenes' imagery, here comes a Making Of for my newest stickers. For these crystal illustrations, I started by using my Winsor & Newton watercolors. Only the final layers of colors were done in my new Shinhan watercolors, which added a nice vibrancy to the more muted and stable Winsor & Newton. I'm not sure if my Winsor & Newton colors appear a bit muted because they're very old (over a decade by now) or because they're pan colors, which are sometimes less brilliant than their tube counterparts. But Shinhan's cheap set really surprised me with their strong, pure pigmentations! The illustrations were painted on my favorite paper, the Fabriano Hot Press Watercolor paper in extra white. This paper is perfect if you want to scan the drawings later since it has nearly no visible paper texture. That makes the whole Photoshop process a lot easier! I started by drawing crystal forms with a very hard pencil, with minimal pressure. The point was to keep pencil lines minimal, and have as little graphite residue on the paper. Soft (2B and softer) pencil leads can leave a bit of graphite 'dust' that will get picked up by the watercolors later on and muddy them. To make the lines even more subtle, I patted them with a kneadable eraser. These erasers allow for pencil lines to be reduced instead of completely erased. I was left with the barest hint of guidelines: Just enough to know where I should place my paints. Since I wanted all the gemstones to have a similar tone to them (inspired by aquamarine crystals) the first thing to do was giving them all a nearly identical base color. Mixing a pale, slightly turquoise blue and diluting it with a lot of water, I painted in all the sketched forms with a large brush. But I did leave empty white paper among the colored spaces to be later turned into shiny highlights. When the initial watery base colors were completely dry, I went in with a smaller brush and started to define the different surfaces of each gemstone. Like with the base color, I worked on all the individual drawings simultaneously to make sure they'd fit together as a set. I'll probably do a more realistic set in the future! I love painting in realistic detail, but sometimes a girl just wants to play around with color. So these are more cute and colorful, less natural. So the coloring process was very intuitive. I did decide on a vague source of light to give a bit of a three-dimensional feel to the crystals but kept the rest playful and colorful. I didn't mix colors but instead applied thin layers of different shades of blue on top of each other. This allows for more vibrancy! As a last step, I used my smallest brush and the mentioned tube colors by Shinhan in Cerulean Blue and Prussian Blue to define corners, edges and reflections. Watercolor paintings tend to look soft, but the gemstone motive asked for sharp borders and cuts! I scanned the finished drawings at 600 dpi at the highest color quality setting of my Epson Perfection V330 Perfection scanner. This particular scanner is great for color accuracy and catches even subtle hues, so I'd recommend it to watercolor artists especially. In Photoshop, I applied a mask to make sure all the white paper was, you know, actually white. This is easier to do before exposure and brightness are adjusted since all textures are still visible. While you can get quite far with 'Color Selection', I do adjust the mask with my graphic tablet and a brush to make sure no speck was overlooked, and all the edges are clean. Then I cranked up the brightness and adjusted white balance with Levels and Curves, and adjusted for any lost vibrancy and saturation. Since the objects were already masked, I also applied a turquoise color layer as a clipping mask on top - set to low opacity (20%) and 'multiply'. This way, the colors would look more saturated even after printing. Once all objects are masked and on a transparent background, it's all the easier to then layout them into sticker sheets. Depending on the project, I either arrange them directly in Photoshop or use InDesign. Comparison of the paintings and the stickers. The stickers are a bit more saturated than the originals, and I changed their hue from Cobalt to Cerulean to fit with the Aquamarine theme. I printed two versions of the gemstone illustrations to be used as stickers: One with the individual gems arranged on A6 sticker sheets and one with them spread out on an A5 format that I then cut into already pre-cut, slightly larger stickers to be sold as a set. Since there was some space left on the crystal sticker layout, I decided to also turn my dessert illustrations into pre-cut stickers. They're now both available on my Etsy shop. Printable version with a color variation for my aquamarine gemstones. If you're into DIY projects and have some sticker paper at the ready, you can print these yourself, as many times as you want. Crystal stickers look best printed on glossy sticker paper imo! Thank you for reading! Would you be interested in a video or in-depth step by step tutorial of my Photoshop process? Explaining digital adjustments in a short, blog-post appropriate form might be a bit lacking, especially for beginners, so I'd be happy to do a longer post on that! I've been a planner and journal keeper for as long as I can remember, but only recently did I get into planner decoration and 'pretty' bullet journal layouts. As a creator of stickers, the logical next step (about five minutes after falling down the #planwithme rabbit hole on instagram) was to draw planner stickers myself. My very first printable planner sticker set was made from basic watercolor textures and patterns, as well as mail and to do list drawings. These were so much fun to paint, and I quickly went on to produce more! So when Valentine's Day approached and I found myself browsing (vegan) dessert recipes way more than any sane human should, the urge to draw cakes and sweets took over! And really, once I start drawing a certain theme, I just have to explore it. That's how my whole beauty & makeup illustration series started. I was armed with a flurry of recipes that were too complicated to bake (I'm a noob), so drawing variations of those delicious cupcakes and tarts, chocolates and muffins was the perfect solution to satisfy my dessert cravings. The illustrations were made in watercolor (with some very light pencil guidelines) on Fabriano Watercolor Paper - the Hot Press one is ideal for small illustrations like these that need to be scanned later on. Its paper texture is near invisible, so the colors turn out even and perfect for printing purposes. Since I wanted these to be simple and sweet (yup), I steered away from too much realism, tiny details, and dark shading. Just lots of bright colors, a bit of watercolor texture and lots of Yellow Ochre and Cadmium Scarlet to keep the color scheme unified. This is how I use Erin Condren Life Planner stickers in my Paperblanks planner: Just flip them around - the width of EC day boxes is the same as the height of Paperblanks' day boxes. Sometimes I just ignore the Paperblanks' guidelines entirely... Work with what you have! Then, the files went over to InDesign to be turned into planner stickers. Since I'm still exploring the world of planner decoration, I don't have a pre-made layout or anything of the sort. Since I don't use any of the popular planner brands like the Erin Condren Life Planner or Happy Planner - mostly since I already had a Paperblanks planner for 2017 laying around - I'm sticking with 1.5" inches wide boxes. Those work for most planners (and I use a height of 1.875" inches so they're suited to the Erin Condren weekly spreads) - and I can flip them around and use them in my Paperblanks planner, too. Now I'm just waiting to buy new sticker paper (I'm living way too far out of the city and need to find time to take the trip to the closest art store!) so I can use these. Dessert stickers should be perfect for recipe note cards, right? The set of three pages for weekly planner layouts is available as a digital download in my Etsy shop 'evydraws'. 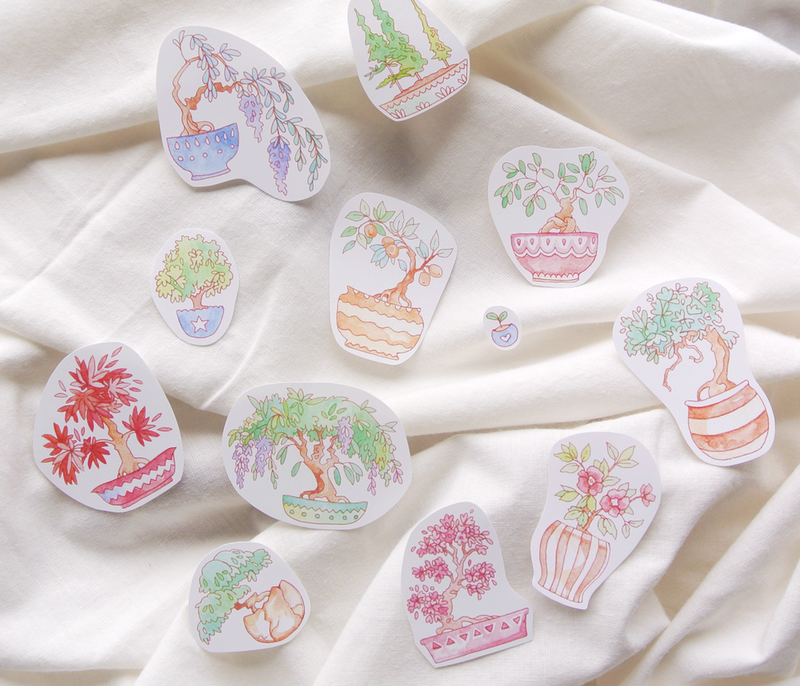 Just print them on sticker paper of your choice and cut them with a cutter or scissors. A free bonus page with fewer boxes and more 'free floating' cupcakes & chocolates can be found in my 'printables' section. Thank you for reading and I hope you'll be using that free printable! If you do - be it for planning, your journal or diary, recipe notes or gift tags - take a picture and tag me if you put it on social media! I love seeing my work in use!